One of my favorite people ever is my daughter. I’ve called her Darling Daughter in this blog for the 5+ years I’ve written it. Since the day she was born and still to this day, I feel lucky. I love every bit of her personality–wouldn’t trade her for any other little girl in the world. She is Perfect. Just as she is. Not like anybody else; unique, and unique in her outrageousness, always has been. Never what I’d call an “easy” child, but I LOVE that about her. Her sense of humor, intelligence, drive, guts, compassion, kindness, her softness with little kids and dogs, her generosity with her brother, and her (sometimes) patience with me. And that whole mix of complexity that is Darling Daughter. I especially love the “college” version of her, because she’s matured, grown into her personality, and she’s far more relaxed than she was in high school, her younger years. Riding in the car not too long ago, she was mumbling. DARLING DAUGHTER: I’m praying. For patience. DARLING DAUGHTER: Not saying a specific prayer. Just talking to The Lord. Driving with me apparently didn’t “feel safe” to her. We tend to have a lot of cars in the driveway, a lot of the time. Last fall, I got a new Mazda. Only had it a few months when I noticed a large dent in its side. The kids were both home on Winter Break (Christmas vacation). ME (TO SON): Did you see the dent in the car? SON: Yeah. Just noticed it. Did you hit something? ME: Me, too. And no, I didn’t hit anything. Son and I were at the dining table. Daugther was at the stove, scooping dinner onto a plate. SON: Maybe it got hit in the school parking lot? Son and I turned (at the same time) to look at Daughter. Her back was to us. She was still loading her dinner plate. DARLING DAUGHTER (Heading over to table): That might have happened. SON: Did you hit it? DARLING DAUGHTER: Yeah, but I didn’t know it left a dent–with all the snow on it. DARLING DAUGHTER: A while ago. I backed into it, when I was trying to get out of the driveway. This was NOT a small dent. But we laughed, continued with dinner. It was a newer car, but just a car. Nobody was hurt. We suspected there might be a mouse (can’t even think of their being mice…) in the house. I was freaking out. Not handling it at all well. Was looking for contact information to call Orkin Pest Control. SON (Deadpan): Just give Lenny a call. DARLING DAUGHTER: Nick just referenced a piece of classic literature, one still considered important enough for high school student reading–in regular conversation. DARLING DAUGHTER: …to thank me for making him take those classes. She referred to the Honors/Advanced Placement track she worked out for Son before his freshman year of high school. Darling Daughter has always guided him with his class schedules. I generally have no idea what he is taking. Son googled sneakers one evening, while doing homework. I rang my daughter. DARLING DAUGHTER: I’m not looking for any shoes. ME: His homework isn’t done. He’s searching for black PF Flyers (from The Sandlot). DARLING DAUGHTER: Tell him he can have them after his homework is done. She is a second mother to her brother. Takes him to concerts, buys him things when they go shopping together, helps him with homework, and talks to him about college, life, relationships, just about anything. She is truly a model Big Sister to her brother. She is often his first call when there is big news–both good and bad. 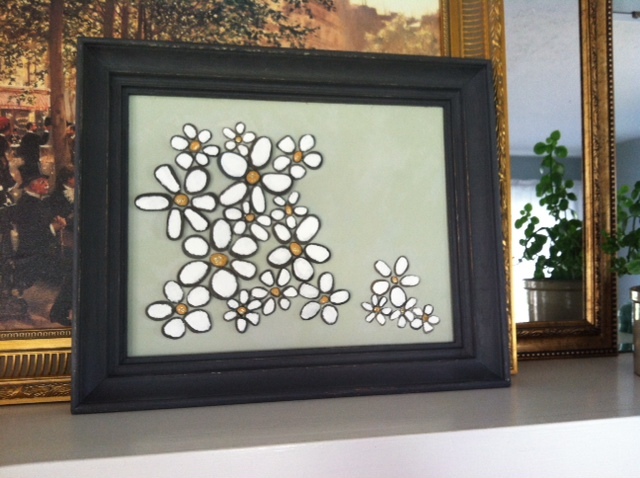 There’s something about daisies that has always made me happy. 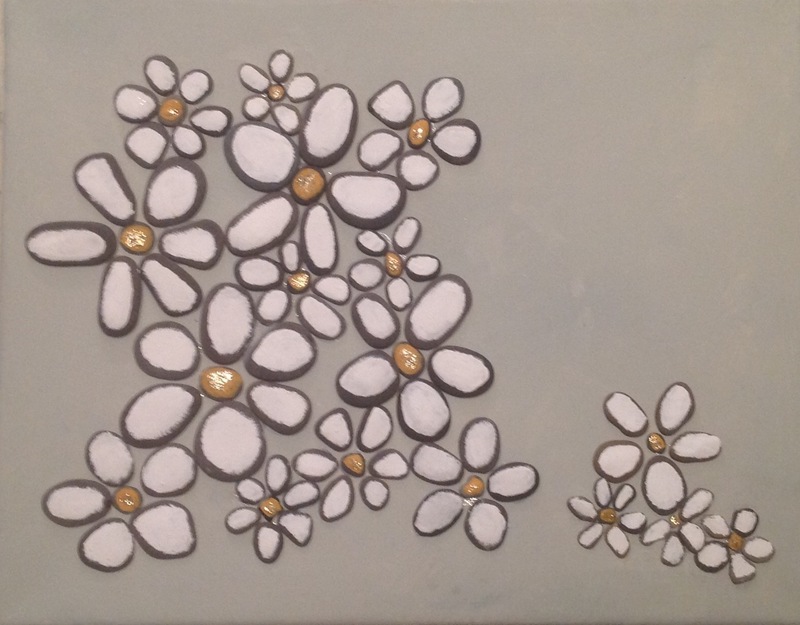 When I started playing with stones, fashioning a trail of daisies on a pale green canvas, I was thinking of my daughter. She identified strongly with the piece. Said I couldn’t sell it. That was the fall of 2014. I ended up having prints made in the Spring of 2015, because many people wanted it. 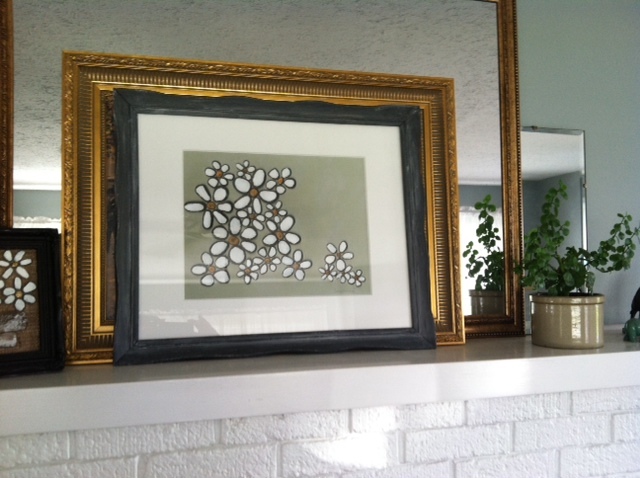 Each time I put a print together with a vintage frame, it’s gone. They sell very quickly. Darling Daugther has the print above her bed at college. Those are the links for anybody interested in seeing the print. The original is sold. To celebrate my new Shopify site, my Daughters print is on sale all week. Today I’m sharing my secret shame. I used to refinish furniture and home decor. Since 2012, I’ve created Beach Art on canvas, with what I find while walking on the beach. Somehow, I’ve lost all control of my rocks, sticks, beach glass, beach wire and plastic. But I always turn my finds into something. (Eventually.) I have workspace in my basement, but I never work there. I try hard to contain the mess. We cannot eat at the dining room table much of the time. On a good week, we’ve got use of half of it. We have to be careful to walk around the piles of vintage and antique frames neatly stacked against the dining room wall, in a corner. The mantle used to be attractive. It’s perpetually a mess now. I set completed pieces up there to make sure I’ve got the right colors and nothing needs added; if something is off, I eventually figure out what’s wrong by walking by it enough times. 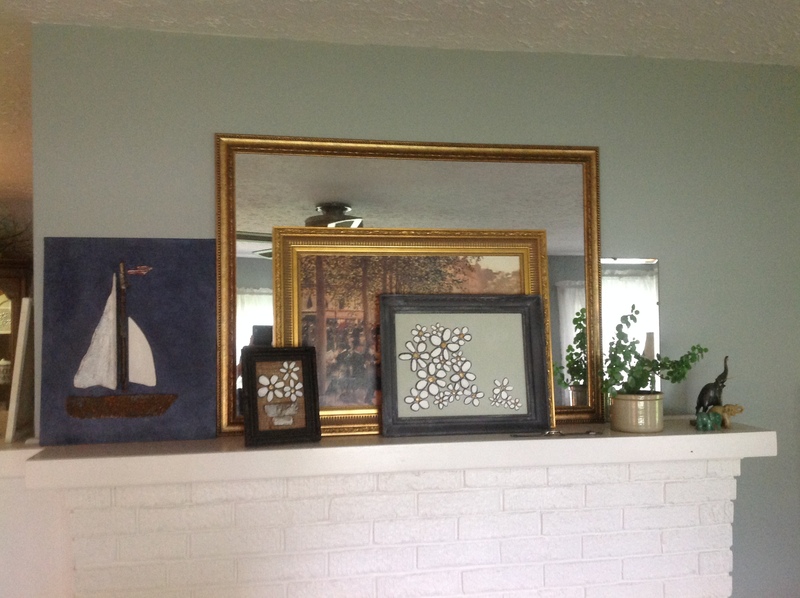 Also, propping pictures up ensures that my Beach Finds are securely attached to the canvas or canvas board. If they get loose after a few days, I fix them. Lucky me! 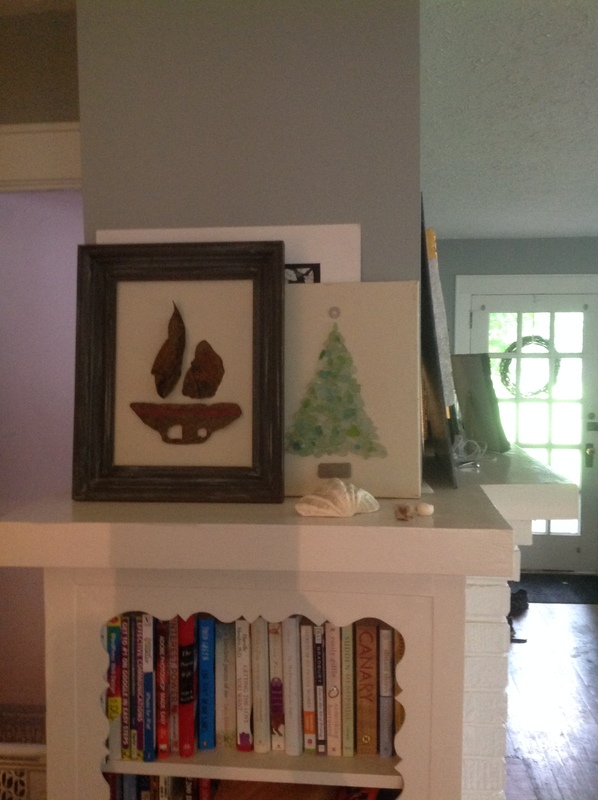 Our mantle wraps around a corner, with a bookcase below it, giving me more square footage of mantle to ruin. We used to have family photos there. Most people store fancy items in their china cabinets. Mine? Full of sticks, beach glass marbles, artists proofs of prints, and more projects in the works. My desk has a triangular jug of beach glass and random stones on it most of the time. I do have a couple of china plates in the cabinet–my mom’s china. It isn’t just beach glass that’s a problem for me. I can’t resist old glass; Carnival Glass, Early American Pattern Glass, and glass vases. I do have a few such items in the china cabinet, but it’s mainly books (I’ll spare you photos of the books stacked all over the house, that’s an “issue” for another day) and the junk I find on the beach. 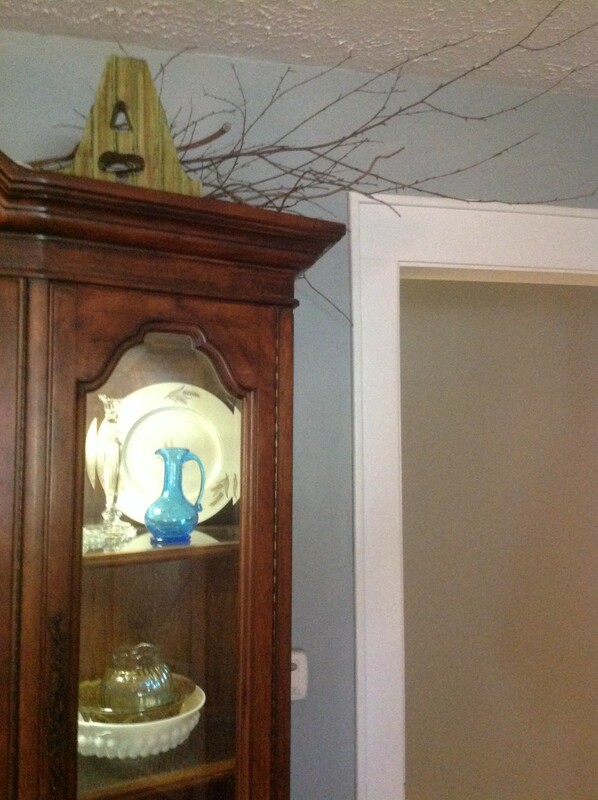 Notice the branches on top of the china cabinet? Even have to walk under sticks to enter the kitchen. The driftwood and metal tree above the park bench is enormous, about 3 feet wide and 5 feet tall. I could have sold it too many times to count, but I won’t part with it. My Beach Art sells easily, faster than I can create it. Which is why I started having prints made. 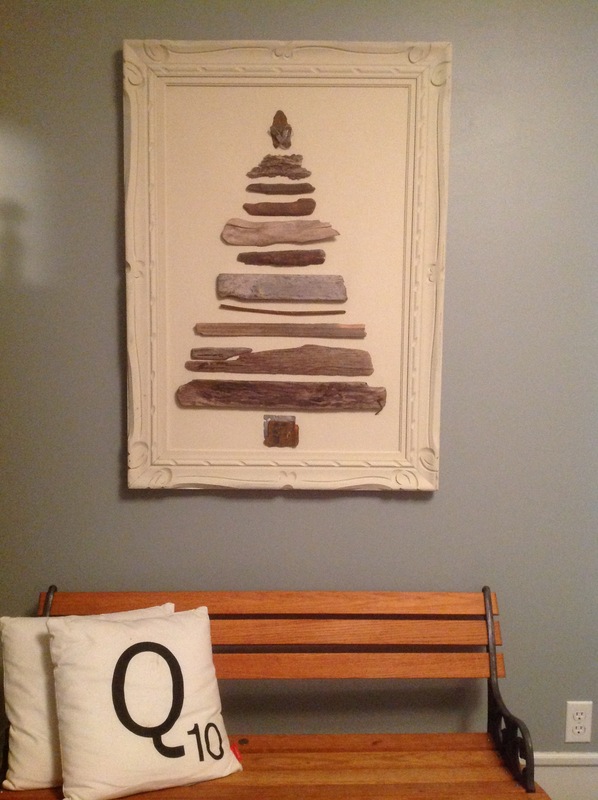 Yes, signed, numbered, “fine art” prints–of sticks, rocks, and beach glass. I keep seeing photos on Facebook of local beach cleanups going on in our area. Good stuff, kids and families getting out there and spiffing up our beaches. But what if they throw away something good? Seriously, that’s what I think when I see the photos. This hit close to home as Legos were my favorite toy as a kid. My very favorite! The only thing better was going outside–I rarely came inside unless it was dark out. I dream of having a workspace outside of my home; a barn, an outbuilding, anything with a bit of wall space to hang a gallery of finished work, my stash of vintage frames. Perhaps with shelving to hold supplies. I typically use pretty clear vintage and antique glass jars/vases to hold my stones, beach glass, metal and such. Makes it easy to sort by size and see what I have. I also use ball jars for storage, and even to mix paint in. My “mess” wouldn’t look like a mess in a workshop. It would look attractive, possibly even stunning. Interested in checking out my projects? Head over to my website. Workspace ideas? Comment below or Contact me. In the meantime, I’ll keep pinning to my “Dream Girl Cave” page on Pinterest.